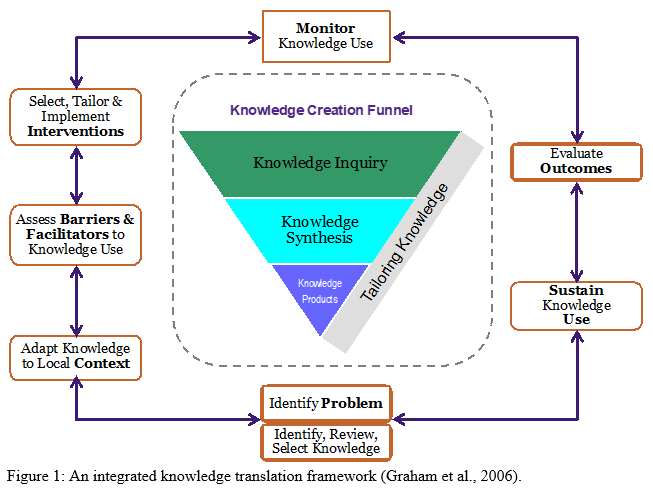 Integrated knowledge translation is a dynamic and iterative process that pays attention to how knowledge will be applied while the evidence is being created for clinical use. The creation of knowledge for practice and the implementation of knowledge into practice are two important components to ensuring best clinical care. The KIPA group believes that paying attention to these two important variables ultimately affects patient outcomes and the quality of care provided. 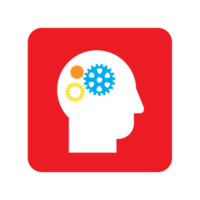 We believe that the creation of knowledge for practice is best accomplished as a social collaboration that includes different perspectives that reflect evidence, clinical expertise and the ability to tailor knowledge for clinical practice contexts and individual patient care. We believe that creating knowledge within a community of practice has the potential to produce wide-spread implementation of that knowledge into practice (Eccles et al. 2009; Moodie et al., 2011a; 2011b). Implementation of knowledge into practice requires an understanding of how the various practice contexts will adapt it for their use because adaptation can affect patient outcomes. It also requires knowledge of the barriers and facilitators to the use of knowledge; tailoring and implementing clinically-applicable interventions to ease and promote the use of knowledge; monitoring the use of knowledge in practice, and evaluations of the functional and process outcomes that occur when the knowledge has been implemented (Brown & Duguid, 2001; Graham et al., 2006; Moodie et al., 2011a; 2011b). The KIPA group focuses on clinically relevant and important questions, and examines them from some aspect of Graham et al.’s integrated KT framework. KIPA North America recently sought to answer the question: What is current clinical practice in pediatric audiology in North America? (Moodie et al., 2016). KIPA Europe is seeking to answer the same question within the European practice context. Studies such as these help us to understand how knowledge created for practice (such as clinical practice guidelines) are being implemented within widely different practice contexts. An understanding of these study results will facilitate the development of new knowledge and/or help us to determine how adaptations of knowledge affect patient outcomes and the quality of care provided. We can use our wide-spread social collaboration of KIPA partnerships to facilitate practice change and promote best practice in pediatric audiology care. This is KIPA’s vision and mission. “Implementation Research is the scientific study of methods to promote the systematic uptake of clinical research findings and other evidence-based practices into routine practice, and hence to improve the quality (effectiveness, reliability, safety, appropriateness, equity, efficiency) of health care. It includes the study of influences on healthcare professional an organizational behavior.” (Eccles et al, 2009).